A Friendly Debate: Challenges of Provenance and Authenticity | Skinner Inc. Renowned for his large-scale sculptures, Henry Moore (British, 1898-1986) was also a prolific draughtsman, producing nearly 7,500 drawings over the course of his career. He made these drawings for a variety of purposes: as works of art in their own rights, as preparatory sketches for sculptures or prints, as nature studies, or as studies of the works of other artists. 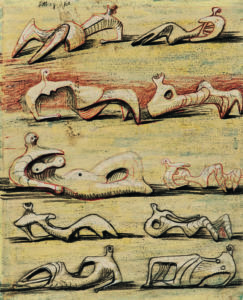 Moore made the drawing Reclining Figures, 1948-50, with the intention of using it as a study for a future print. The lower section of his 1950 color lithograph, Standing and Reclining Figures, includes the lower portion of the drawing. My husband and I have always considered this painting our most precious possession and have prided ourselves on having a genuine Henry Moore, probably the only one of its kind in Lebanon or the Middle East. For some time now, we have been having an argument with our friends about it, and after much hesitation, I thought of writing directly to you for your verdict. Do the words “Lithograph Reclining Lead figures” at the top mean that it is a lithograph? … Would you be good enough to remove at least one source of local conflict from the Middle East scene? Your drawing is a genuine drawing and not a lithograph. At the time I did the drawing I thought I could do a lithograph at some time based on this drawing. In fact, I did make a lithograph using the lower part of your drawing in 1950. By the time the drawing’s owners and Moore corresponded, Moore had become an internationally recognized figure, and the drawing highlighted one of his signature motifs: the reclining human figure. By writing to Moore directly, they established not only a written trail of the provenance of the work but also provided the work with an interesting story—both of which would make any object more desirable. The fact that the owners and their friends could not determine on their own whether the work was a drawing or a print is not unusual. Even experienced professionals sometimes need the help of a magnifying loupe to discern the nuances of line and pigment that differentiate a drawing from a lithograph. While they could have consulted a local art expert, how much more interesting an exchange of letters with a renowned artist is! Because they went directly to the source (something that can often be easily achieved when an artist is living), they also ensured that the work was documented with Henry Moore and his archives. Today, the Henry Moore Foundation maintains a vast archive and a user-friendly online catalogue raisonné. The drawing is easy to find there, and its entry includes a digital copy of the black and white photograph the owners sent to Moore in 1973. If they hadn’t corresponded with Moore, the drawing may never have been noted in the catalogue, and its authenticity would have been more difficult to confirm. What began as an entertaining exercise aimed at solving a dinner party debate resulted in an important set of documents proving authenticity and establishing provenance. Because the owners had that documentation in hand when they decided to offer the drawing at auction, the process of researching and cataloging the work was quick and easy. Without the correspondence and the Henry Moore Foundation records that were established thanks to that correspondence, the work would have to have been sent to England for review by the Foundation—a lengthy and expensive process that would have delayed the sale and incurred sizeable expenses for the consignors. Whenever the history of purchase, of ownership, or direct correspondence with an artist or recognized expert exists, it makes for a smooth and successful auction process and saves the time and expense of researching and authenticating. I must say, though, as much as I appreciate and delight in reading those letters and documents, I also enjoy the challenge of doing some provenance and authenticity research myself! Henry Moore’s Reclining Figures (Lot 462, Estimate: $50,000-70,000) will be offered in the American & European Works of Art auction on January 25, 2019. This entry was posted in Blog and tagged art prints, British artist, Fine Prints, Henry Moore, lithograph, modern art, modern artist, prints by Kathleen M. Leland. Bookmark the permalink. A well written piece that echoes our own sleuthing. We bought a Modigliani that was originally owned by a patron in Chile. We knew of Modigliani’s friendship with the Chilean artist Manuel Ortiz de Zarate but we had the devil of a time tracing this work from Chile to seller in the U.S. We bought it blind and then it took another year to trace the lineage ….wow! In the end there’s only one answer — provenance is hard work, nothing more, nothing less. Thank you, Douglas. You are correct that provenance research is difficult and time consuming; however, the payoff can be great (in both personal satisfaction and monetary return). Congratulations on your success!